Mentioned is the way you can write. People looking for jobs can easily download these F.Sc (Pre. 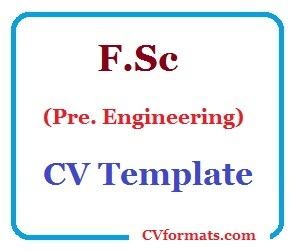 Engineering) CV Template in word or pdf format or just view it online to copy and paste. Cover letter of F.Sc (Pre. Engineering) CV Template is also available. Just change the name , address , qualification and experience and your F.Sc (Pre. Engineering) CV Template is ready. House No.18 A , Rehman Colony Lahore Cantt. To become a Chartered Accountant and join a challenging organization where I can utilize my all professional knowledge and skills for the achievements of the organizations goals and objectives and to enhance my professional skills by achieving complex and challenging tasks and last but not least to serve my country. ACCA (Four papers Passed) College of Accountancy and Professional Education. Ms Office (Ms Word, Ms Access, Ms Power Point). Proficient in internet and e-mail use. Well versed in using Quick – Books accounting software. Reference will be served on demand. that is not a CV.This Is a school work for babies. I am looking for best cv sample . If this is not a best what is the best cv. You call this cv as a school home work then send me a sample of a cv please. Thanks. Hahahhahaha funny tempelate when some see the C.V like this Formater than make a ball of this c.v & throw it i to the basket…………. I need a job of Accountant in any field. I need a job of Accountant in any field of Life.